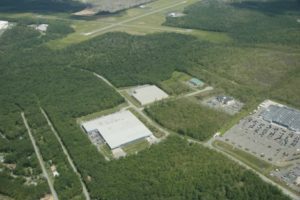 In the early 1970s, Pocono Mountains Industries purchased 360 acres to develop a new park (the Pocono Mountains Business Park) adjacent to the Pocono Mountains Municipal Airport. In order to develop this property, a water and sewer system were constructed with the help of the United States Economic Development Administration (E.D.A.) and to this day is operated and maintained by PMI’s sister organization, the Pocono Mountains Industrial Park Authority. Phase I of the park houses Mount Pocono Coca-Cola, Moritz Embroidery, Monadnock Non-Wovens and JPA Masonry. In 1990, land was purchased for a second phase of this park. United Envelope Corporation currently employs almost 300 people at this location. Summit Aerospace recently purchased a new building for expansion and Geisinger employs about 45 people in a comprehensive medical clinic. There are approximately 104 acres of property remaining in Phase II of the park of which 62 acres is designated Keystone Opportunity Zone and the remainder has LERTA designation.